How do you pumpkin this holiday season? 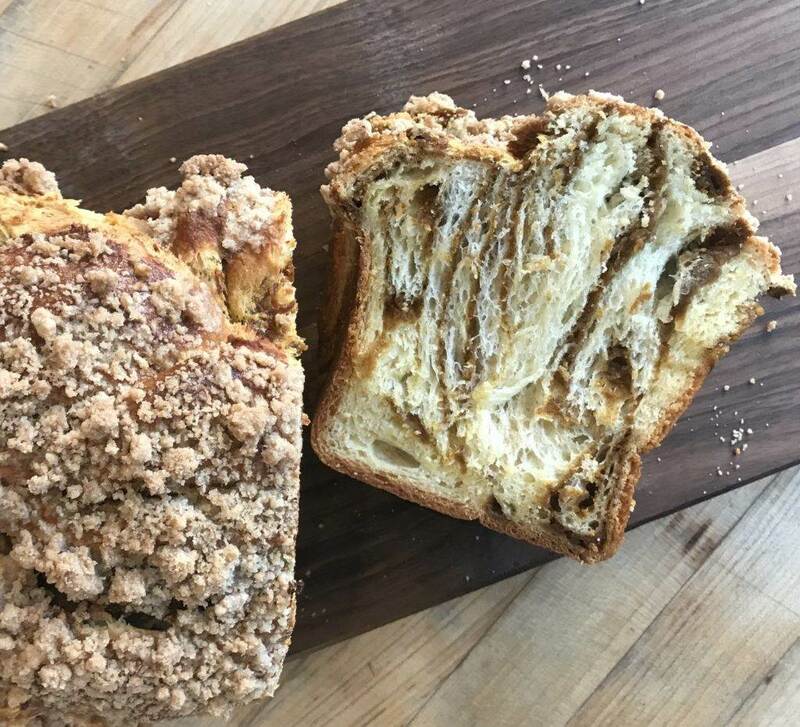 We prefer it ribboned throughout a rich, buttery brioche and topped with a gorgeous cinnamon crumble! This recipe makes two loaves (and the BEST bread pudding if you happen to have any left over). Cream the butter by itself in the bowl of a stand mixer with the paddle attachment until it no longer has any lumps; you're looking for a cold, smooth butter. Place the milk, zest, yeast, extract and sugar in the bowl of a stand or hand held mixer. Whisk in the eggs until they are broken up. Add the flour and salt and knead with the dough hook for about 10 minutes. Your dough should be strong enough not to tear when you pick up a small handful and slowly stretch it from the sides (you can also lift up the dough hook and see how it hangs onto the hook- if the dough is falling right off, knead another minute or so). Add the butter and knead another 3-4 minutes. Place in a bowl or on a cookie sheet lined with buttered parchment paper and cover with plastic or parchment touching the dough. Chill for 8-48 hours. Prepare the filling (see below). Split your dough in half (remember, this makes two loaves) and lightly dust your work surface with flour. Line a medium loaf pan with a piece of parchment paper. Using floured hands or a rolling pin, press or roll your dough into a rectangle about 12"x10". Spread the filling to nearly all the edges. Roll your dough up, pulling a bit as you do to make the roll taught without tearing the dough. Once you've reached the top edge of your roll, pinch it to seal. Grab a knife (or, my favorite tool- the bench scraper) and slice the whole roll lengthwise to make two long ropes. Twist the two ropes together, then fold the whole twist in half and twist again. Place the double twister babka right into the loaf pan. Repeat with the remaining dough, placing the shaped twist into the freezer if you only have one loaf pan to work with. Let your babka(s) rise for 1-1/2 to 2 hours at room temperature or overnight in the fridge. Preheat oven to 325F. Whisk up your eggs and brush over the bread. Crumble topping over the egg wash. Bake for about 40 minutes. Cool for at least 45 minutes before removing from the pan (we know! it's so hard)!! Mix all ingredients together. Chill with the dough to make it easier to spread once the dough is ready to handle. Place all ingredients in a medium bowl together. Rub the butter into the dry until crumbles form.